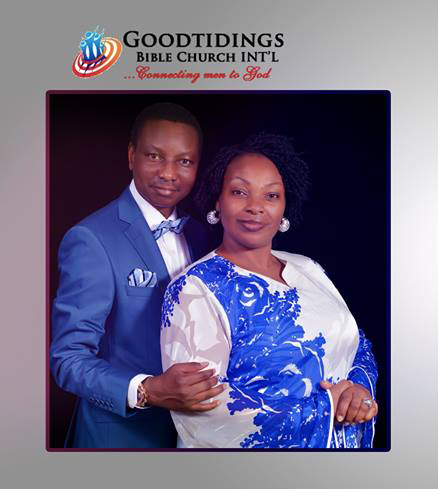 Dayo Olutayo, Senior Pastor of Good Tidings Bible Church International (GTBCI) has displayed traits and unction which qualifies him to be addresses as possessing an apostolic dimension of divine favor. Dayo Olutayo is the controversial in-law to Bishop David Oyedepo, by reason of being the younger brother to Faith Oyedepo, the wife of Nigeria’s richest and most generous pastor. He is a mechanical engineer by training. Dayo Olutayo and her elder sister Faith Oyedepo came from a family where good Christian ideals are highly espoused, such that even their father, who died at ripe old age, was still very spiritually sound till death. Dayo was introduced to ministry work by Bishop Oyedepo where he served as a church assistant and actually lived with the Oyedepos for a few years , until his boss felt he was matured enough to pastor a branch. His first official posting as a Resident Pastor was the Maiduguri Branch of Winners Chapel. He showed ministerial grace and excellence which earned him another foreign posting to Nairobi Kenya in 1995. It was on record that within three years, a church started from the scratch was able to erect a 3500 seater auditorium, built debt free and dedicated in 1998, a feat never experienced in the history of church building projects of any other church, in the entire nation of Kenya. The Grace of God upon his life earned him another posting to Abuja to supervise the transition from Area1 to Durumi District and subsequently he was consecrated a Bishop. Bishop Afolabi, Bishop Dickson and Bishop Adjeman and Bishop Olutayo formed the third level of Hierarchy in the Bishopric office under the Ministry. 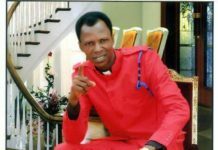 The normal wind of transfer associated with Living Faith Church came calling in 2004 and Bishop Dayo Olutayo was sent to Port Harcourt. This decision of his boss and in-law to remove him from the lucrative Abuja Diocese to make way for a hierarchically senior colleague, Bishop David Abioye, to replace him, did not go down well with him. He introduced Bishop Abioye to his flock, jetted down to Port Harcourt, took over from the man there, returned back to Abuja, ostensibly to prepare to relocate finally to the new territory, and he ended up relocating finally out of Winners Chapel. Dayo Olutayo shortly after his return from Port Harcourt circulated a leaflet where he denounced his Bishopric Office and described it as a title under ‘Living Faith Church’, resigned from the church and started Good Tidings Bible Church. The controversy generated by his resignation almost tore the former church apart and many disappeared from the Abuja church such that the halls were half empty. It took the special grace upon Bishop Abioye for Durumi Church, depleted by his exit, to gather back multitudes. When he dragged his spiritually sound biological father to Good Tidings Bible Church, months after his exit from Winners Chapel, ostensibly to ward off perceived spiritual attacks from some quarters, out of protest over his controversial exit, I refused a passionate invitation from a close friend privy to the information that Dayo’s father will be in Church Service on Sunday, to see this aged man who have raised children of no mean spiritual stature. I was personally against his resignation and told some persons very close to him then that severing a gospel work practice under such controversial and acrimonious manner does not augur well with the body of Christ. Secondly, Port Harcourt Branch of the Church is equally lucrative and is regarded as the third highest in terms of income in Nigeria. The feedback I got was that Olutayo had earlier informed Bishop Oyedepo that he wants to be released to start a new gospel work, and the later told him to hold on, and in the process of waiting, a transfer he believed was laden with hidden agenda was hoisted on him. This was happening at a time when Bishop Adgeman forcibly took over the Ghana Branch of the Church and converted it to his private inheritance, a matter Presidents Obasanjo and Kufour of Nigeria and Ghana respectively, were unable to resolve. It was the same 2004 that a strange illness came near her sister Pastor Faith Oyedepo, ostensibly to take her life. I viewed these catalogues of events with suspicion and as such vowed not to support anything that looks as an accomplice. However, one cannot prophetically deny that Dayo Olutayo has the calling of God upon his life. His followers have also attested to unusual favor they get whenever people flock round him. What is favor? Favor is ‘Unusual delight in the personality of someone’. This unusual delight can attract unusual contracts, promotions, finances, gifts, helps, assistance and even association. Therefore, nobody can deny that this man has such flowing around him. In Good Tidings Bible Church, testimonies of favor have become so common that it is no more celebrated. Persons have been astronomically promoted, businesses suddenly turned around, miracle jobs, miracle marriages, and mega contracts through processes that show only a magnetic influence of delight associated with God’s favor. Isaiah 66 vs 2 says, “These are the ones I look on with favor: those who are humble and contrite in spirit, and who tremble at my word.” Amplifying further, 2 Chronicles16 vs 9 says, “For the eyes of the LORD run to and fro throughout the whole earth, to show himself strong on behalf of them whose heart is perfect toward him” This simply means that divine favor is God showing himself strong to people who are humble, contrite in spirit and tremble at his word, to ensure that they get what their natural prowess, ability, connections cannot get. This is a summary of the grace OF God upon Pastor Dayo Olutayo. Dayo Olutayo also gets involved in feeding the poor and helping the less privileged in the society irrespective of religious leanings. Muslims, Christians and Pagans have all benefited from his ministry of rehabilitating the poor and needy in Abuja in dimensions never exhibited by any other church in the city. What he introduced years back as a process of feeding the poor has metamorphosed into a Lifegate Care Centres located around Abuja where the poor are fed occasionally. In addition, a quarterly programme of feeding, clothing and rehabilitating the poor and needy called Kingdom Welfare Day (KWD)has become a regular feature in the church. Diverse categories of scholarships are also given out to the less privileged, in dimensions not witnessed around the city. Dayo Olutayo has been able to organize the numerous wealthy and highly placed personalities in Good Tidings Bible Church into utilizing their God-given privileges, opportunities and wealth into making the larger society a most habitable place to be. He teaches Christian leadership and corporate responsibilities and believes that a man’s worth is what he gives out to the society, not what he receives. The massive and architecturally crafted cozy church auditorium which runs two Sunday services is situated at Utako Area of Abuja also has a primary and secondary school. Dayo Olutayo is an Apostle of Favor and at this time when the devil is unleashing arrows of stagnation, shame, frustration and disappointments and failure at faithful church members especially around Africa, heavy doses of Apostolic favor is necessary to counterbalance the onslaught.